The two most compelling frontiers of exploration in the 21st century are the oceans and space. Humans have been exploring the surface of the sea for thousands of years and the edge of space for the past half-century, but technology developments are just beginning to allow for the exploration of the deep oceans and worlds beyond our own. In this post, I will offer some of my observations on the practical similarities between ocean and space exploration. I imagine life at sea is very similar to life in space. In both cases, you live and work in close quarters with small crews. You rely upon each other's training and expertise to maintain the vessel’s complex systems including propulsion, navigation, life support, and equipment supporting the scientific mission. Clear divisions of responsibility are required so that everyone knows his or her job, but cross-training is also important so crewmembers can fill multiple roles. It is also critical that all crewmembers are trained and prepared for emergency situations like fires or abandoning the vessel. In fact, being fit enough to respond to a wide range of contingencies is the main reason medical requirements are so strict for astronauts. The isolation and long-duration of remote expeditions dictate that crews must learn to work well together. That is why periodic special occasions are needed to break the tedium of the daily routine and encourage the group to bond. On the Okeanos Explorer, we had cheese and shave ice parties, the Golden Dragon ceremony, and a photo contest. I even taught a tsunami class for the crew one evening. The ship also has a well-stocked library of books, movies, video games, and board games for individual or group entertainment. Likewise, crews in space must unwind. For example, ISS crewmembers watch videos while doing their daily exercise. I’ve noticed that exercise is an important daily ritual for most people aboard the ship too. It’s necessary to maintain one’s level of fitness in the limited mobility environment of the ship. Whether in the ocean of space or the seas of the Earth, the environment external to the craft is harsh and can be deadly. You cannot survive long if you get separated from your vehicle. Deep-sea submarines are the closest analog for spacecraft due to the impossibility of going outside without dire consequences. However, ships on the ocean surface are also good approximations, as are remote outposts like Antarctic bases. As I have experienced firsthand on the Okeanos Explorer cruise, sometimes a few days pass before I remember to go outside at all, but at least I have the option. That’s the main difference compared with a higher fidelity analog such as a submarine. For more reading on this subject, I highly recommend the book "Bold Endeavors: Lessons from Polar and Space Exploration " by Jack Stuster. I find myself reflecting upon it often. Hot off the presses is a new NASA publication (SP-4701) called "Risk and Exploration: Earth, Sea, and the Stars" that I'm eager to read too. The underwater environment is Earth’s best analog for the conditions of microgravity in space. It presents challenges in terms of temperature, pressure, visibility, and movement. That is why astronauts are required to have significant SCUBA experience and spend most of their practical mission training underwater in a neutral buoyancy training facility. NOAA owns the world’s only fully operational permanent underwater habitat, where NASA aquanauts have conducted many simulated space missions there through its NEEMO program. NOAA’s Aquarius Reef Base is located off the coast of Key Largo, Florida. The privately-funded Atlantica Leviathon Habitat is also in Florida. Nearly complete, it will be ready for its first crew by next year. Fellow A4H member Erik Seedhouse has a new book coming out next month called "Ocean Outpost: The Future of Humans Living Underwater " that goes into this topic in more detail. One of the Okeanos Explorer’s main features its is telepresence system, which allows people across the planet to observe real-time high-definition video and data feeds from the ship’s remotely operated vehicle (ROV). 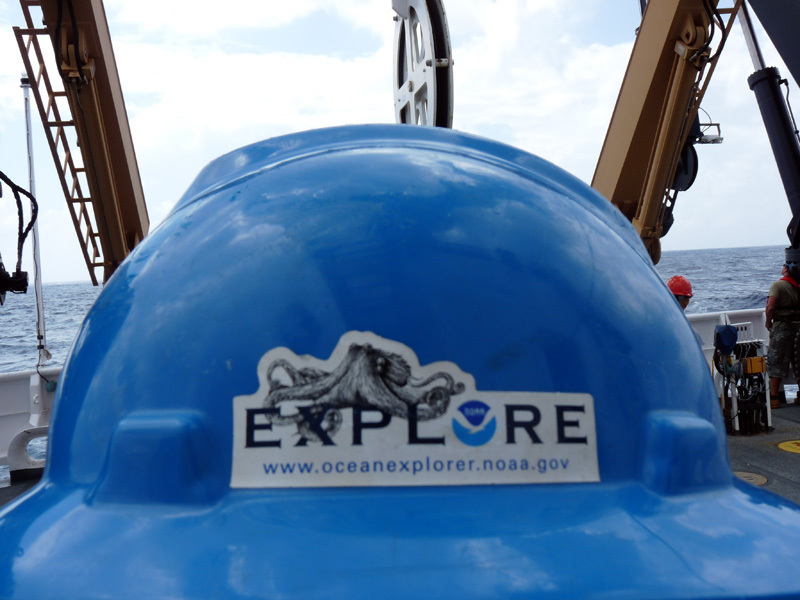 Scientists don’t have to be present on the ship to participate in the exploration process and can provide direction to the ROV pilots from one of NOAA’s Exploration Command Centers. ROVs are widely used in oceanography and played very important roles in assessing and fixing the oil spill disaster in the Gulf of Mexico recently. It's no surprise that companies like Oceaneering provide submersible and related technologies for both ocean and space purposes. Similarly, telepresence plays a central role on space missions. In the event that a crewmember becomes ill or needs surgery, telemedicine would be used where a flight surgeon on the surface would direct the medical officer in orbit on how to treat the patient. A Mars exploration strategy that some people support is not sending humans to the surface of Mars but to explore it virtually via telepresence instead. We are already doing this today via the long-lived twin Mars Exploration Rovers, but control is asynchronous due to the large distance between Earth and Mars. To make the telepresence real-time, one idea is to set up a base on Phobos. From there, the crew could control rovers in real time on the martian surface via telepresence. The advantage would be that you don’t risk contaminating any indigenous life that might be there and can more easily protect yourself from radiation by burying yourself in the loose regolith on the moon’s surface. No matter how you look at it, a strategy of combined human and robotic operations, aided by information technologies, will be the norm for the future of exploration of remote environments on any planet. Whether you’re careening through low earth orbit at 17,240 miles per hour or moseying along the central Pacific at 10 knots, if something happens to disrupt the normal operation of your ship, you are on your own to fix it. Perhaps that self-reliance is the best parallel between space and ocean exploration. In either case, crews must have the "right stuff" in order to adapt to changing conditions. All they have to rely upon for their survival is their own ingenuity using the resources at hand. Who knows, what may have been discarded as trash on Earth could save your life in these remote environments. It’s a lesson we can all take to heart as we live on terra firma. Thanks to all of the folks aboard the Okeanos Explorer and in the NOAA Office of Exploration and Research who made my participation on this cruise possible. It provided me with invaluable experiences for professional and personal growth. The Okeanos Explorer is an impressive operation with a compelling mission that resonates strongly with my own interests. It can serve as a model for our exploration of both the oceans and of space in the future. Awesome post! Great information about your journey, and all the components and complications for analog environments. I fully expect to see you on one of the NEEMO expeditions one of these days, LOL... wish I could have been at your tsunami class, too. I visited Oceaneering once, and saw a couple of the guys who actually work with training astronauts in the NBL pool, they are an amazing organization -- I should do a post about them too, they should be better-known for all they do!